This Kit has a full retail value of $86! This full-size kit contains a trio of Briogeo's best selling Blossom & Bloom cleansing, conditioning, and finishing products that are all fortified with follicle stimulating ginger, ginseng, and biotin to provide immediate visible fullness and long-term hair growth benefits. Blossom & Bloom Ginseng + Biotin Volumizing Shampoo: Water, Sodium Cocoyl Isethionate*, Cocamidopropyl Hydroxysultaine*, Lauramidopropyl Betaine*, Glycerin*, Disodium Laureth Sulfosuccinate*, Polysorbate 80*, Sodium Lauryl Sulfoacetate*, Soyamidopropyldimethylamine Oxide*, Maltodextrin*, Biotin, Panthenol, Panax Ginseng Root Extract, Zingiber Officinale (Ginger) Extract, Zingiber Officinale (Ginger) Root Oil, Tocopheryl Acetate*, Aloe Barbadensis Leaf Juice, Argania Spinosa Kernel Oil, Citrus Aurantium Dulcis (Orange) Peel Oil, Citrus Grandis (Grapefruit) Peel Oil, Citrus Tangerina (Tangerine) Peel Oil, Cocos Nucifera (Coconut) Oil, Lavandula Angustifolia (Lavender) Oil, Mentha Viridis (Spearmint) Leaf Oil, Santalum Album (Sandalwood) Oil, Sodium C14-18 Olefin Sulfonate*, Sodium Cocoyl Glutamate*, Sodium Lauroyl Sarcosinate*, Polyquaternium-7, Polyquaternium-71, Fragrance, Citric Acid, Benzyl Alcohol, Dehydroacetic Acid. *Coconut, Vegetable, Plant, or Sugar Derived. Blossom & Bloom Ginseng + Biotin Volumizing Conditioner: Water, Aloe Barbadensis (Aloe) Leaf Juice, Cetearyl Alcohol,* Brassicyl Isoleucinate Esylate,* Brassica Alcohol,* Propanediol,* Cetrimonium Chloride,* Cetyl Esters,* Ethyltrimonium Chloride Methacrylate/Hydrolyzed Wheat Protein Copolymer, Isopropyl Myristate,* Biotin, Panax Ginseng Root Extract, Rosa Canina (Rosehip) Fruit Oil, Argania Spinosa (Argan) Oil, Prunus Amygdalus Dulcis (Sweet Almond) Oil, Panthenol (Provitamin B5), Tocopheryl Acetate (Vitamin E), Maltodextrin,* Calendula Officinalis Flower Extract, Zingiber Officinale (Ginger) Root Oil, Citrus Grandis (Grapefruit) Peel Oil, Citrus Aurantium Dulcis (Orange) Oil, Guar Hydroxypropyltrimonium Chloride (Natural Guar Gum), Lauryl Pyrrolidone,* Acrylic Styrene Copolymer, Citric Acid, Dehydroacetic Acid, Benzyl Alcohol. *Coconut, Vegetable, Corn, Starch or Plant Derived. 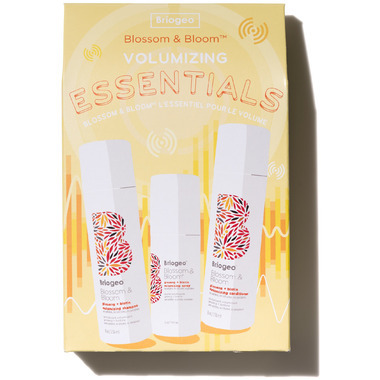 Blossom & Bloom Ginseng + Biotin Volumizing Spray: Water, Alcohol Denat. (Grain Derived), Hamamelis Virginiana (Witch Hazel) Leaf Extract, Hibiscus Sabdariffa Flower Extract, Polysorbate 80 (Coconut Derived), Maltodextrin/Vp Copolymer, Panax Ginseng Root Extract, Biotin, Glycerin (Coconut Derived), Citrus Medica Limonum (Lemon) Peel Extract, Leuconostoc Radish Root Ferment Filtrate, Tocopherol (Vitamin E), Citrus Grandis (Grapefruit) Peel Oil, Zingiber Officinale (Ginger) Root Oil, Aurantium Dulcis (Orange) Oil, Dehydroacetic Acid, Benzyl Alcohol. *Coconut, vegetable, plant, sugar, or grain derived. This is a great product. Have mature, fine, wavy, frizzy hair and this helps my hair taming frizz and helps in the hydration of dry hair. Smells wonderful. Would recommend. Not good for my fine hair. I found the spray okay for adding a bit of temporary volume, but my hair quickly looked weighed down and oily. The shampoo does not seem to give volume; and after several washes I am starting to believe it leaves a film on the hair that builds up over time... now even immediately after I wash my hair it does not look clean but rather separated and greasy--horrible! These products smell delicious, they don't weigh down my hair, and I really like them! They are a bit pricey, so I don't know that they are worth the extra money when they are full price, but I will happily pick up more next time they are on sale. Best volumizing products I've ever used(on fine colour treated hair). Smell is to die for. Will definitely repurchase!